William Bainbridge was born in Princeton, New Jersey, on 7 May 1774. He entered the merchant marine in 1789, at the age of fifteen, at nineteen became commander of a merchant ship, and in 1798, Bainbridge married, at the island of St. Bartholomew, Miss Susan Hyleger, daughter of a merchant, and granddaughter of the governor of St. Eustatia. On the organization of a navy in 1798, Bainbridge was given command of the schooner RETALIATION with the rank of lieutenant-commandant. He was soon afterward captured by the French frigates VOLUNTEER and INSURGENTE, but the schooner was returned to Bainbridge by the governor of Guadeloupe, and he proceeded with her to the United States, carrying many American prisoners, for whom, he had obtained their liberty. For his services, Bainbridge was promoted to the rank of master-commandant, and given the command of the brig NORFOLK, of eighteen guns. In NORFOLK, Bainbridge operated against French forces in the West Indies during the Quasi-War, eventually capturing the French lugger REPUBLICAN and destroying other vessels. In May, 1800, Bainbridge was ordered to take command of the frigate GEORGE WASHINGTON, and on diplomatic mission, to carry tribute to the Dey of Algiers in order to safeguard the growing American merchant fleets from attack by corsairs. On his arrival at Algiers, Bainbridge was obliged to accede to a demand of the Dey to carry presents to Constantinople, and also an ambassador to the Ottoman Porte. At Constantinople, Bainbridge paved the way to the first treaty between the United States and the Ottomans. On 20 May 1801, Bainbridge was appointed to command the ESSEX, forming part of the squadron under Commodore Richard Dale, to cruise against the Barbary powers. Then on 20 May 1803, he was ordered to command the PHILADELPHIA, of 44 guns, of Commodore Preble's squadron, fitting out to cruise against, Tripolitan corsairs. On his arrival in the Mediterranean, he captured the Moorish ship-of-war MESH-BOHA, of 22 guns, and recaptured the American brig CELICA from Barbary corsairs. On Bainbridge's arrival off Tripoli he gave chase to a Tripolitan corsair and struck an uncharted rock, on which the PHILADELPHIA was wrecked. Surrounded by Tripolitan gun-boats and forced to surrender, Bainbridge, his officers and crew remained captives in Tripoli for nineteen months. PHILADELPHIA was floated off the rock by the Tripolitans and carried into the port of Tripoli, where she was later burned by American forces led by then Lieutenant Steven Decatur. When peace was restored Bainbridge was acquitted of all blame for the loss of the PHILADELPHIA. After regaining his freedom in 1805, Captain Bainbridge supervised naval facilities and the construction of the fledgling American Navy and, while on leave, again served in the merchant marine. He returned from the last of his commercial voyages in 1812, shortly before the United States went to war with Great Britain. Commanding first the Boston Navy Yard, Bainbridge solicited the command of a frigate, and his request was complied with by giving him command not only of the CONSTITUTION, but of the frigate ESSEX, Captain David Porter, and the sloop HORNET, Captain James Lawrence. Relieving Captain Isaac Hull shortly after his victory over the HMS GUERRIERE, Bainbridge sailed for the South Atlantic. On 29 December 1812, CONSTITUTION was sailing in the Atlantic about 30 miles off the coast of Brazil when sails were sighted on the horizon, and CONSTITUTION altered course to investigate. The ship proved to be HMS JAVA, a frigate similar to GUERRIERE. Both frigates stood for each other and cleared their decks for action. At approximately 2:00 in the afternoon, she began a fight with the faster HMS JAVA. Commodore William Bainbridge was wounded twice, and the ship's wheel was shot away, but for more than 2 hours he maneuvered brilliantly and fought tenaciously until, finally, JAVA had no masts left standing and her Captain lay dying. This time, there were 34 American casualties as opposed to around 150 British. Like GUERRIERE, JAVA was too badly damaged to bring home - but before sinking her, Bainbridge had her wheel removed to replace the one shot away on CONSTITUTION. Commodore Bainbridge on his return to the United States in February 1813, was received with high honors, awarded a congressional gold medal, and ordered to command the Charlestown Navy Yard, where he laid the keel of the line-of-battle-ship INDEPENDENCE. After the end of the War of 1812, the American government turned its attention back to the Mediterranean where Algiers had resumed preying upon American shipping while the United States was preoccupied by its recently concluded war with Great Britain. Work fitting out two American squadrons promptly began - one at Boston under Commodore Bainbridge and one at New York under Commodore Steven Decatur. Commodores Bainbridge and Decatur led squadrons in a show of force that resulted in a peace settlement with Tunis 13 July 1815 and with Tripoli 9 August 1815. Having enforced the peace in less than 6 weeks from time of sailing from the United States, and combined an entire naval force assembled at Gibraltar under Commodore William Bainbridge of 18 warships, including ship-of-the-line INDEPENDENCE, 5 frigates, 2 sloops-of-war, 7 brigs, and 3 schooners, it was the largest fleet ever collected under the American flag in the Mediterranean to that time. Commodore Bainbridge was commander of Navy forces afloat at Boston for much of the rest of the decade, and in 1820-21 flew his flag in the ship of the line COLUMBUS during another Mediterranean cruise. He was later Commandant of the Boston Navy Yard, served as a Naval Commissioner in 1825-1828 bringing about much of the Navy structure used to this day, and then was Commandant of the Philadelphia Navy Yard. Bainbridge returned to the Boston command in 1832, but ill health forced him to leave that post in 1833. He was attacked by pneumonia, and died on 28 July 1833. His remains were interred in Christ Church, Philadelphia. Supporters: The crossed cannon barrels symbolize the past naval weaponry and naval readiness. The Shield: The shield represents the protective power of the Aegis Weapons system. The Dark Blue and Gold, colors traditionally associated with the Navy, represent the sea and excellence. The anchor reflects the maritime tradition and achievement. The four silver stars recall the previous ships named in honor of Commodore Bainbridge. The ship's wheel symbolizes navigation. Gold denotes honor. The four bosses, the circular knoblike objects, reflect the warships commanded by Commodore Bainbridge; George Washington, Essex, Philadelphia and Constitution. The Congressional Gold Medal centered on the wheel, represents the award received while commanding the ship Constitution, for it's December 1812 victory against HMS JAVA. This highest honor was awarded for his outstanding heroic service during the battle when the Constitution's ship's wheel was destroyed and he replaced it with the JAVA's wheel. The olive wreath denotes peace and Commodore Bainbridge's diplomatic missions in the Mediterranean. The border indicates distinction and 'battleship gray', is the primary color for the destroyer. Black denotes dignity. Born during the American Revolution, the thirteen pellets allude to the original 13 colonies, including New Jersey, the birthplace of Commodore Bainbridge. 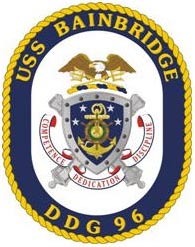 The Crest: The bald eagle, the symbol of National defense, power and authority, exemplifies Commodore Bainbridge's patriotism. 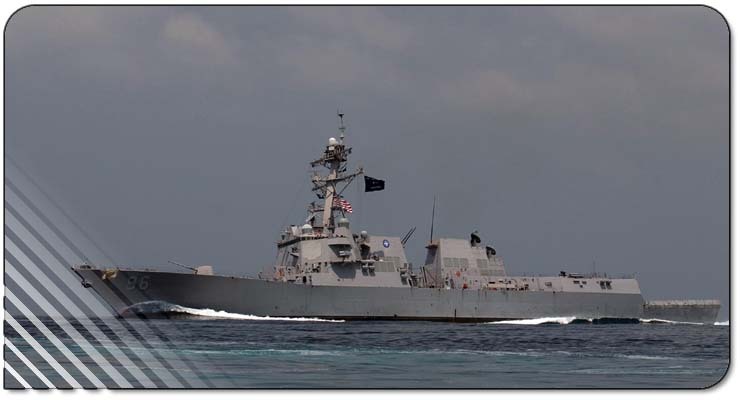 The crossed tridents signify sea power; also, denoting the ship's modern technology, the AEGIS system and electronic warfare capabilities of the combat weapon system. Motto: Red, white and blue are the national colors. The motto embodies the Commodore's spirit and attitude throughout his military service.